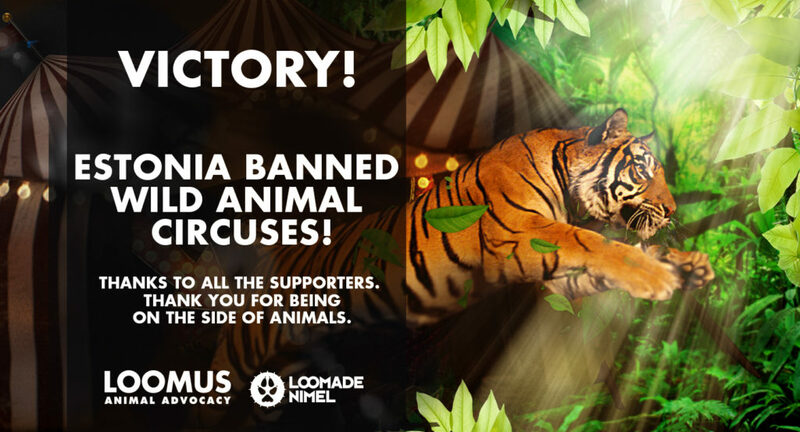 Greatest victory in the history of Estonian animal protection: Estonia banned wild animal circuses! The bill that bans the use of wild animals in circuses passed the third – and also the last – reading at the Riigikogu, the parliament of Estonia. NGO animal advocacy organization Loomus and animal rights movement Loomade Nimel thank all politicians who voted for the bill, the Rural Affairs Committee of Riigikogu, animal protection organizations, and other supporters in Estonia and abroad thanks to whom it is now possible to celebrate the greatest victory in the history of Estonian animal protection. “The reason this decision can be seen as significant is that it will affect the lives of many animals today and in the future,” explained Kadri Taperson, the manager of Loomus. “As a matter of fact, today, animal advocates fulfilled a promise made to elephant Medi, who died in Estonia in 2013. Negotiations between animal advocates and the authorities to ban the use of wild animals in circuses began right after this tragic incident,” said Taperson. Anita Jürson, the spokesperson for the movement Loomade Nimel, says that Riigikogu’s decision shows that Estonia is moving towards a more caring society. “Owing to this law, wild animals will no longer have to suffer from indecent living conditions and training methods in circuses. We will definitely continue our work to achieve new heights in animal protection,” declared Jürson. 83 members voted for the bill. The bill specifies the regulations concerning the use of animals in animal exhibitions, competitions, fairs, auctions, or other public events where animals are brought together. It is only allowed to use animals of species or subspecies born into artificial conditions, whose natural behavior or lifestyle enables the use without causing any harm to the animal’s health. The list of allowed species and subspecies will be determined by an act by the Minister of Rural Affairs. Loomus and Loomade Nimel continue to work towards a ban that would prohibit the use of all animals in circuses.